Born at Nepomuk about 1340; died 20 March, 1393. The controversy concerning the identity of John of Pomuk or Nepomuk (a small town in the district of Pilsen, Bohemia), started in the eighteenth century, is not yet decided. The principal question at issue is whether there was only one John of Nepomuk, or whether two persons of that name lived in Prague in the second half of the fourteenth century and met with precisely the same fate. This inquiry leads naturally to the further question, as to the true cause of John's violent death. In a controversy of this character it is of primary importance to set down clearly the information given in the original sources. Extant documents, ecclesiastical records, and contemporaneous accounts of the second half of the fourteenth century relate in unmistakable fashion that in 1393 a certain John of Nepomuk was Vicar-General of the Archdiocese of Prague, and that on 20 March of the same year by command of King Wenceslaus IV of Bohemia he was thrown into the Moldau and drowned. This John was the son of Welflin (or Wölflin), a burger of Pomuk (Nepomuk), and studied theology and jurisprudence at the University of Prague. In 1373 he took orders and became public notary in the archiepiscopal chancery, and in 1374 was made prothonotary and first secretary of Archbishop John of Jenzenstein (Jenstein). In 1389 he received the parish of St. Gallus in Prague, and, continuing meanwhile his studies of jurisprudence at the university, was promoted in 1387 to the doctorate of canon law. He was also a canon in the church of St. Ægidius in Prague, and became in 1389 canon of the cathedral in Wyschehrad. In 1390 he gave up the parish of St. Gallus to become Archdeacon of Sasz, and at the same time canon of the Cathedral of St. Vitus, without receiving however any cathedral benefice. Shortly afterwards the archbishop named him president of the ecclesiastical court, and in 1393 his vicar-general. King Wenceslaus IV of Bohemia, wishing to found a new bishopric for one of his favourites, ordered that at the death of Abbot Rarek of Kladrau no new abbot should be elected, and that the abbey church should be turned into a cathedral. The archbishop's vicar-general, however, interposed energetically on this occasion in defence of canon law. When Abbot Rarek died in 1393, the monks of Kladrau immediately held a new election, the choice falling on the monk Odelenus, and John, as vicar-general, promptly confirmed this election without referring to the wishes of the king. Upon hearing this Wenceslaus fell into a violent rage, and had the vicar-general, the cathedral official, Provost Wenceslaus of Meissen, the archbishop's steward, and later the dean of the cathedral thrown into prison. The first four were even tortured on 4 March, but, although the others were thus brought to acquiesce in the wishes of the king and the official even proposed everlasting secrecy concerning all that had occurred, John of Nepomuk resisted to the last. He was made to undergo all manner of torture, including the burning of his sides with torches, but even this could not move him. Finally, the king ordered him to be put in chains, to be led through the city with a block of wood in his mouth, and to be thrown from the Karlsbrücke into the river Moldau. This cruel order was executed on 20 March, 1393. We possess four contemporaneous accounts concerning these proceedings. First of all, the extant bill of indictment against the king, presented to Benedict IX by Archbishop John of Jenzenstein, who went to Rome with the new Abbot of Kladrau on 23 April, 1393 (Pubitschka, Gesch., IV, app. ; ed. Pelzel, "Geschichte König Wenzels", I: "Urkundenbuch", 143-63). Some years later Abbot Ladolf of Sagan gives an account of it in a somewhat abbreviated form in the catalogue of the Abbots of Sagan completed in 1398 (ed. Stenzel in "Script. rerum Silesiacarum", I, 1835, pp. 213 sqq. ), as well as in the treatise "De longævo schismate", lib. VII, c. xix (Archiv für österreichische Geschichte, LX, 1880, pp. 418 sq.). A fourth reference is to be found in the "Chronik des Deutschordens", a chronicle of the Teutonic Knights which was compiled by John of Posilge who died in 1405 ("Scriptores rerum Prussicarum", III, Leipzig, 1860—, 87). For the discussion of the question it is important to remark that Archbishop John of Jenzenstein in his above-mentioned indictment (art. 26) calls John of Nepomuk "martyr sanctus", and that, in the biography of John of Jenzenstein by his chaplain, John of Nepomuk is described as "gloriosum Christi martyrem miraculisque coruscum". It is thus clear that his contemporaries had already begun to honour as a martyr and a saint the vicar-general put to death by the cruel and licentious tyrant for his defence of the law of the Church. The body of John of Nepomuk was drawn out of the Moldau and entombed in the cathedral of Prague, where in fact, as is proved by later documents, his grave was honoured. In his "Chronica regum Romanorum", finished in 1459, Thomas Ebendorfer (d. 1464) relates that King Wenceslaus had Magister John, the father confessor of his wife, drowned in the Moldau, not only because he had said that "only he who rules well is worthy of the name of king", but also because he had refused to violate the seal of the confessional. The refusal to violate the seal of the confessional is here for the first time given as the reason for John's violent death. The chronicler, who speaks of only the one John drowned by order of King Wenceslaus, evidently refers to the John of Pomuk put to death in 1393. In the other chronicles written in the second half of the fifteenth century, we find the reason regularly assigned for the execution of John, that he had refused to tell the king what the queen had confessed to him. Paul Zidek's "Instructions for the King" (sc. George of Podiebrad), completed in 1471, contains still more details (cf. Schmude in "Zeitschrift für kathol. Theologie", 1883, 90 sqq.). He says that King Wenceslaus suspected his wife, who was accustomed to confess to Magister John, and called upon the latter to declare the name of her paramour. On John's refusal to say anything, the king ordered him to be drowned. In this old account we do not find the name of the queen or any date assigned to this occurrence; a little later the year 1383 is given, when Wenceslaus's first wife, Johanna (d. 1389), still lived. In his "Annales Bohemorum" ("Kronika ceská", first printed in Bohemian, Prague, 1541; translated into Latin and published by Gel. Dobner in 6 vols., Prague, 1761-83) the Bohemian historian, Hajek von Liboczan (d. 1553), in view of these varying accounts, is the first to speak of two Johns of Nepomuk, who were put to death by order of King Wenceslaus: one, the queen's confessor, and martyred for refusing to violate the secret of the confessional, having been thrown into the Moldau in 1383; the other, auxiliary Bishop of Prague, drowned in 1393 because he confirmed the election of the monk Albert as Abbot of Kladrau. The later historians of the sixteenth and seventeenth centuries give more or less legendary details of the universally accepted martyrdom of John, because he refused to violate the secret of the confessional. Bohuslav Balbinus, S.J., in his "Vita b. Joannis Nepomuceni martyris" (Prague, 1670; "Acta SS. ", III, May, 668-80) gives the most complete account. He relates with many details how on 16 May, 1383 (this date is already found in old accounts), John of Nepomuk, because he steadily refused to betray the confession of Queen Johanna to King Wenceslaus, was by order of the latter thrown into the Moldau and drowned. 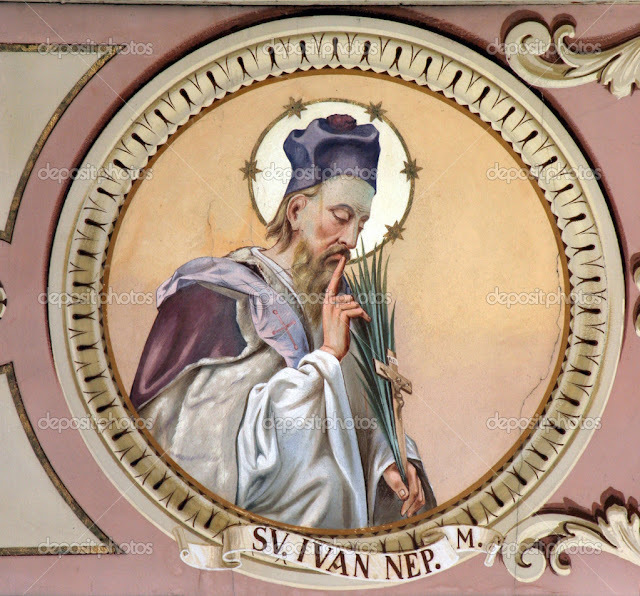 From the year 1675 the cathedral chapter of Prague repeatedly petitioned Rome for the canonization of Blessed John of Nepomuk, who enjoyed special veneration in Bohemia. In the years 1715-20 evidence was gathered and the cause examined; in 1721 followed the beatification, and in 1729 the canonization. The acts of the canonization are based on the statements, according to which John died on 16 May, 1383, a martyr to the secrecy of the confessional. But ever since 1777, when the Augustinian Hermit, Athanasius a Sancto Josepho, sought to prove by the testimony of Archbishop Jenzenstein's written accusation, which did not become known till 1752, that John of Pomuk was put to death by Wenceslaus in 1393 for the reason given above, the controversy has never ceased.